This is a practice designed specifically for government agencies. In a step-by-step manner, it can evaluate the ICT usage, generate ICT integration plan, and monitor the ICT performance on user engagement and empowerment. These three steps can improve citizens' involvement in sustainable development governance regime. The proposal of this practice addressed the challenges faced by both the government and the citizens in governance regime. There is a common understanding that conducting sustainable governance is vital to mitigate and to adapt to climate change. We have explored many different sustainable development governance tools so far. Our society has established high-level political platform, city-level mayor alliance and grass-roots community campaign to promote sustainable development. However, we still need to organize individual that adopt sustainable values into a community that lives by sustainable development values. The practice, if adopted, can create a network that allows, or rather stimulate, communications among all sustainable development governance stakeholders. By stakeholders, we mean government agencies, citizens, non-government organization, academia, business etc. Enabled by AI and machine learning, the practice can generate a real-time data-driven communication that either involves interpersonal communication or stimulate one. This kind of interactive communication is vital to connect and bond people into a value-sharing community. Actions of the proposed practice. Step 1 of the Practice: Evaluate the current ICT performance in user experience. This evaluation can be done by an external contractor at a low cost as the evaluation questions are already set up by the developer of this practice. These evaluation questions are free to use as long as the results of these evaluation questions are shared with the commons. The data generated from applying the evaluation questions will, in turn, create a benchmark for the status quo of ICT usage. The current progress of this step is that we have developed some data crawling programs to automatically get the data we need from certain ICT platforms, such as social media or online community, to answer the evaluation questions. In addition, we have developed manuals on how to conduct the qualitative part of the evaluation. Thus, the evaluation can be conducted with minimal training fairly quickly. Step 2, Compare the targetted government agency's use of ICT against the benchmark. We will approach sustainable governance institutions, such as EPA, DNREC, DESEU, UN Sustainable Development Knowledge Platform or World Business Council on Sustainable Development, to pitch this practice. If any of them shows an interest, the next step is to compare the agency's ICT usage with the benchmark. This step will inform the institution where it stands among the sustainable development governance agencies. The comparison with peers provides an incentive for the institute to improve its ICT usage and to market its advantages. Step 3, propose improvement suggestions based on both the evaluation result and the theoretical framework. Generating the evaluation-data-driven improvement suggestions for the institutes is a straightforward process. However, we have not yet touched upon the backbone of the practice yet. The foundation of this practice is a theory developed by Jiajing Bi through her doctoral study. We would like to discuss with anyone who is interested to learn more about the theory. For the sake of the contest, we will stick with the practical implication of the theory. It offers these unique prospectives in ICT designs. A citizen-centered design instead of an institutional mindset. All the information crowded onto one page and separated into different categories according to the institution's mindset of who their audiences are. As a result of this practice, the new design of the same webpage will include soliciting public opinions on what they want to learn about Radon through social media, blogs and all the existing engaging ICTs that EPA used. Rather than a general Contact Us function, this page shall adopt a Live Chat or an ICT that simulated interaction to allow users to ask questions regarding Radon and share their experience of using this webpage. 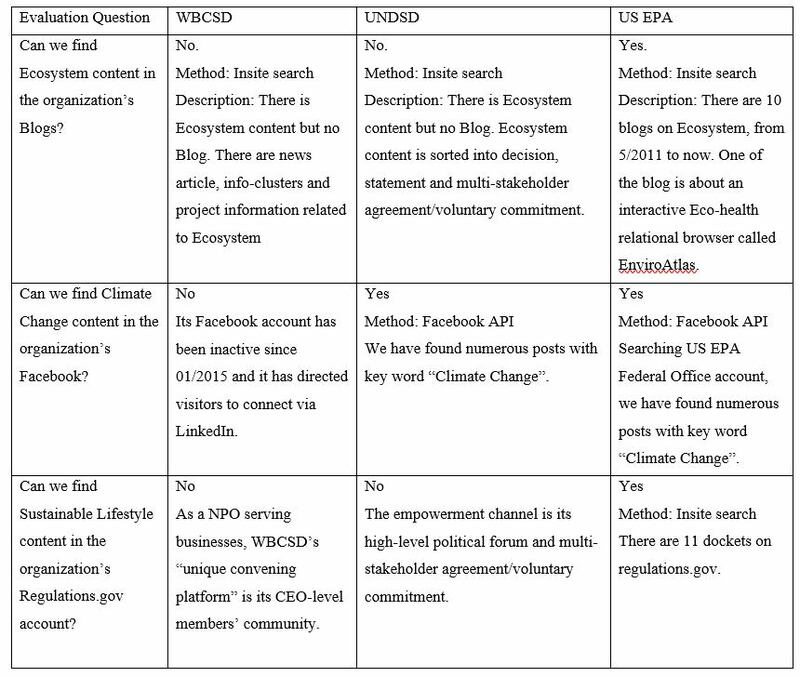 Whether to have a live chat supported by EPA staff or to have an AI on the other end collecting user feedbacks depends on the budget and staffing of the institution. According to the theory's finding, a user-centered discussion group or a Facebook group with the governance institution's participation will be even better. 2. Integrating the informing, engaging and empowering functions onto one ICT Platform. 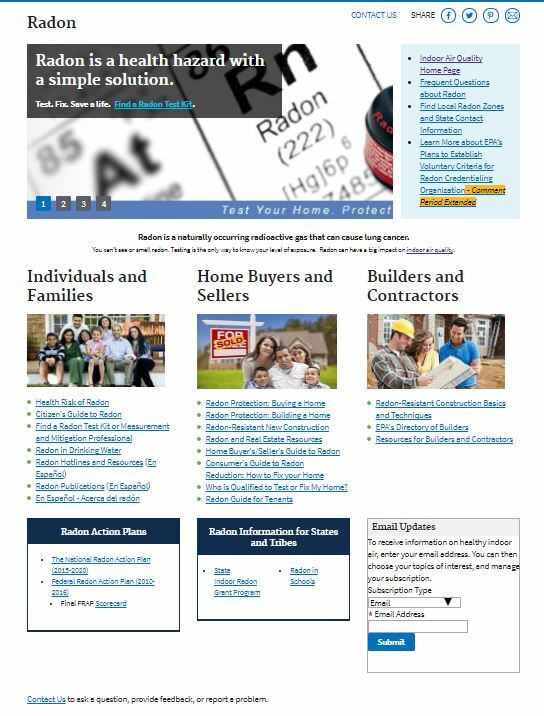 Please allow us to use the EPA Radon topic page as an example again to illustrate this practice. The institute has identified the following stakeholders that play some roles in addressing the issue of radon. They are individuals and families, homebuyers and sellers, builders and contractor. We have mentioned in the previous discussion, that these might not be all the stakeholders that are involved but are the ones identified by the institute. Even these are all the stakeholders that shall be involved in the discussion of addressing radon, they are segregated by the design of the webpage. Information is pre-sorted and separated so that the users will "efficiently" learn only the information that concerns them. This kind of web design fulfills the informing functions quite well. We used to use the website as a medium to spread out information and to get information to our preferred audience. However, as the author stated in her doctoral study, informing users alone is not sufficient to promote behavior change. In order to promote sustainable development behaviors, there needs an integration of informing, engaging and empowering in the communication of sustainable development values and ideas. In addition to one-way communication of sending information to the receipts across the screen, the same communication platform, say the webpage of radon, in this case, shall integrate engagement function and participatory function onto the exact same page. For example, there shall be a link to a Facebook group discussing Radon that opens to the general public and is monitored EPA. There shall be a discussion forum or an organization blog that experts participated on radon that allows the users to communicate. An example of integrating empowerment will be as such: sorting out the relevant regulations and policies, posting them onto the webpage and highlighting out the relevant section, explaining the background and reasons behind the regulations, opening up public comments, and offering timely feedbacks and interaction from the institution's end. Other than providing timely response and interaction, the other empowering features only involve a different way of organizing the existing content and integrating social media better. This integration requires a time commitment from the web-content manager. Our practice suggestion the institute starts with the webpage that the users visited most often so as to be cost-effective. But this integration is vital if we want to build a community of various stakeholder communicating and collaborating with each other to address the multi-dimensional challenge of climate change. When the targetted institute thinks through the practices that they would like to adopt, they shall launch pilot project or A/B testing to monitor the change of user experience. There will be two components that we monitor. One is the user experience on the new design. Since the new designs embrace the two-way communication between government and citizens, we will be able to evaluate its performance by monitoring the public inputs and the government's inputs. This evaluation is quite straightforward. The other component is the monitoring and evaluation following the evaluation questions set up in step 1. This practice allows the institute to benchmark their ICT integration and track their improvements over time. It can also help facilitate the re-design of its website if the process stretches too long. We understood that website redesign is unlikely to receive priority funding from the government agency. Therefore, this cost-effective mechanism to constantly updating on ICT performance is both practical and useful. The government agencies, especially the heads of these agencies, plays a vital role in the initiation of this practice. Their beliefs and understanding of information communication technology and citizen engagement and empowerment will determine if the proposed practice will be explored. For example, the Obama administration has a strong belief in technology and open government. As the result, executive orders on open data and transparent government are signed. We have seen in the past 8 years, a lot of improvement on the communication between government and citizens. Yet, a different executive office can change the story drastically. One can understand this point by comparing the achieved EPA.gov and the current running website. The other key actor is the IT staff with government agencies. The state employers will determine the cost of adopting the proposed practice. If they are already equipped with such mindset, they may only need a brochure that highlights the key elements of the practice and can tailor the programs for the agency themselves. If they are familiar with the ideas of the proposed practice, they might only need a minimal training to follow the step-by-step guide to the practice. If a government agency doesn't have an in-house IT staff that can work on this practice, an additional cost will occur as they hight an outside contractor. Last but not least, the key actor to the success of this practice is the citizens, or rather the individuals that have not lost their faith in government. Only if there is still a demand to communicate with the government will there be a chance for this practice. The individuals that understand climate change and the importance of sustainable development regime will be the supporting pillar for the future of this practice. The actions of this proposed practice will be taken in governmental agencies at local, regional and state level. It is a practice that shall be adopted by the agencies with regulating jurisdiction. We intend to start our campaign of the practice with the Delaware state government agencies and Newark municipal government, where we locate. This practice needs a pilot project to illustrate its usefulness. Where there is a community of people that are politically invested, in other words, actively participated or eager to participate in governing is vital. Usually, a university town fits that description and Newark, DE, is one of them. The small population of DE also decrease the difficulty to communicate with the government and general public. The proposed practice will promote the sustainable development values and knowledge that eventually leads to behaviors that adapt to climate change and/or cut down greenhouse gas emission. Its impact will be determined by the online communication this practice influenced. For example, if ACEEE or other institution adopts this practice in communicating with the public regarding energy efficiency, we shall expect an increase of energy efficiency behavior adoption. Studies have shown that these energy efficiency behaviors can lead to cutting down our energy consumption by half. Broadly speaking, this practice can help the state government meet the UN Sustainable Development Goals, especially Goal 16, 17 11 and transform itself into an open and transparent government. Let me use a more specific example to illustrate. If it is conducted in Delaware, or in other regions participating in RGGI, this practice can help communicate the design of RGGI, its economic cost and environmental impact to local residents. When the citizens are well informed, engaged and empower in the discussion of RPS, we might see a better consistency of these local mitigation policies. There will be two parts of the projected costs.The first one will be identifying the governmental agency that is interested in the proposed practice. This will be extremely difficult to estimate. Luckily, we are concerned with the implemented cost here. In the scenario where the governmental agency has the staff to launch the practice itself. The cost can be neglectable. We will be offering the guidance for free as long as the agency shares their data with us. In the other scenario where the agency has no capacity to implement the practice. They can either hire us or an outside contract for implementing the practice. The cost varies. If it is us they choose to work with, the cost will be around $8000 for re-organizing the website and $500 per month for backend data sorting, monitoring, and evaluation. Additional costs will occur if they want to develop new ICT features that engage and empower its users. The short-term (1-3 months) impact is increasing the citizens' involvement at participating agencies. In the short-term, the practice is still led by the governance regime. The citizens need to be informed about his two-way communication channel between the agency and the general public. The agency needs to inform its capacity via the existing communication channels, such as direct mail, TV advertisement, News update and social media announcements etc. The medium-term impact will be citizens exploring the new website that empower them to participate in the policy-making process and engage them in the governance conducts. Both the public and the government needs to adjust their way of communication when the new interactive and interpersonal communication channels are opened. For example, the government agency will find itself using most of its time and resources to address the challenges of How to well-inform the public and lead the discussion towards collective decision-making. On the other hand, the public will struggle to find a balance between the silent majority and the active minority. The long-term impact may be a new way of conducting governance. The citizens will be well-informed, closely engaged in the discussion of programs, projects, policies, and regulations. Moreover, citizens will be empowered in the decision-making. It is a new model of democracy and a promising tool for reflexive governance. We are not saying this practice guaranteed such effect in the long term. With an optimistic mind, we suggest that this might be one of the outlooks in the far future. It is also possible that in the next decades, we will still need to address the challenges of lobbying and corruption, bribed citizens' inputs, or even AI faked public votes. Ahmad, Q.K. et al. IPCC WGII Fourth Assessment Report. Chapter 20: Perspective on Climate Change and Sustainability. Ajzen,I. The Theory of Planned Behavior, Organization Behavior and Human Decision Processes, 1991. Ajzen, I. & Fishbein, M. Understanding Attitudes and Predicting Social Behavior. Englewood Cliffs, NJ: 1980. Christakis, N. A., and James. H. F. Connected: The Surprising Power of Our Social Networks and How They Shape Our Lives. New York: Little, Brown and Company, 2009. Cornwall, A. & Gaventa, J. (2001) “From users and choosers to makers and shapers: Repositioning participation in social policy”. Brighton, UK: Institute for Development Studies. Davis, A. & Lithwick, D. Government 2.0 Access to Information: Recent Developments in Proactive Disclosure and Open Data in Canada. April 15, 2010. Fishbein, M.; Ajzen, I. (1975). Belief, Attitude, Intention, and Behavior: An Introduction to Theory and Research, Addison-Wesley: Reading, MA. Foggy, B.J. 2009. “A behavior model for persuasive design”. In Persuasive ’09: Proceeding of the 4th International Conference on Persuasive Technology, New York: ACM. Henry, A D. “The Challenge of Learning for Sustainability: A Prolegomenon to Theory”. Human Ecology Review, Vol. 16, No.2, 2009.